The next version of Mac OS X, Leopard, that's coming this October sports a handful of features for photographers. One of my favorites, and most highly touted is Time Machine. As Apple puts it, "More than a mere backup, Time Machine makes an up-to-date copy of everything on your Mac — digital photos, music, movies, TV shows, and documents — so you can go back in time to recover anything." Since most of us don't use automated backup, having this feature baked right into the operating system is going to save lots of data for many, many people. And for photographers, that should mean never losing another image. My second favorite feature was Quick Look. This seems like a real timesaver when searching through images and documents. According to Apple, "Using Quick Look in Leopard, you can view the contents of a file without even opening it. Flip through multiple-page documents. Watch full-screen video. See entire Keynote presentations. With a single click." I sometimes use Preview for this very task, but Quick Look seems faster and more versatile. One other new goodie that I think we'll find useful is the next version of iChat. Not only can we video conference as before, but now with the new "theater" function, we can share slideshows, iPhoto libraries, Keynote presentations, videos, and more in the iChat interface while meeting with others in remote locations. Our ability to show off our work in live conferencing will be much easier, and very pretty to look at. I'll be covering more Mac OS X Leopard in the future, but this should give you a good taste of the "photographer highlights" from today's keynote at WWDC. 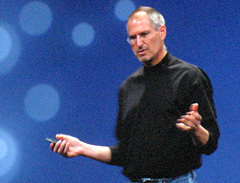 Photo of Steve Jobs speaking at WWDC by Derrick Story. Quick Look is very cool. I especially like the coverflow view. ...and no iPhoto or iWork news. It'll be interesting to see what happens after the iPhone is announced. What I can't wait to see is 64bit support. This may be the thing that will take Aperture to the next level - 64bit OS 64bit Aperture No more complaining about speed!